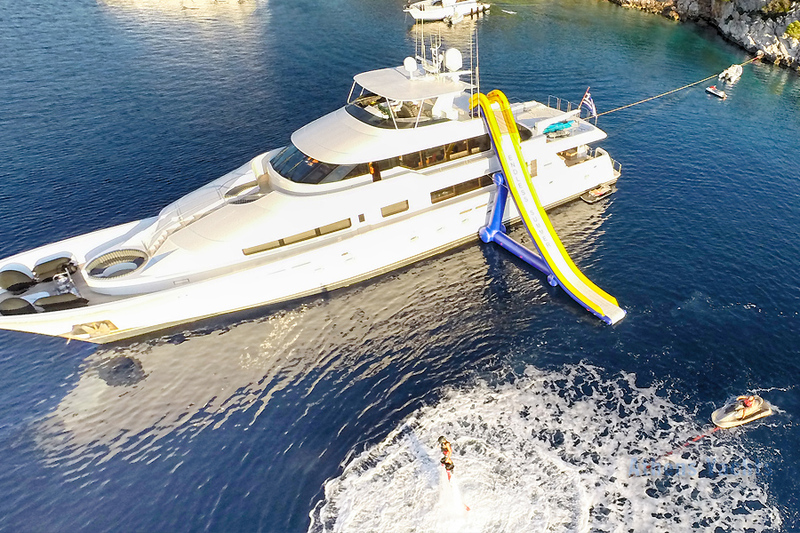 ENDLESS SUMMER is an excellent 130’ Westport (USA) power yacht, built in the USA in 2001, and available for charter in Greece with Greek crew. 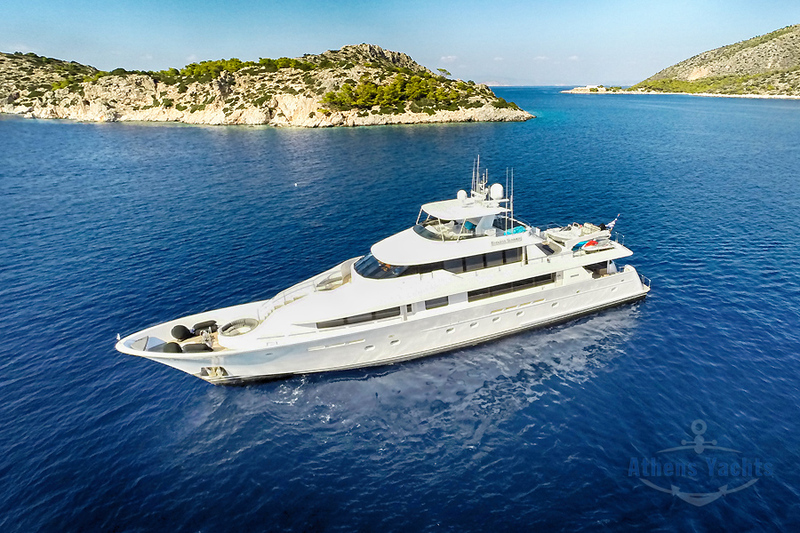 Over the past two winters she has been refitted extensively; her engines were overhauled in 2016, and her skylounge was converted into a sunny, VIP stateroom with private terrace with Jacuzzi in 2015. The King bed there faces aft through glass doors onto the private terrace with Jacuzzi. 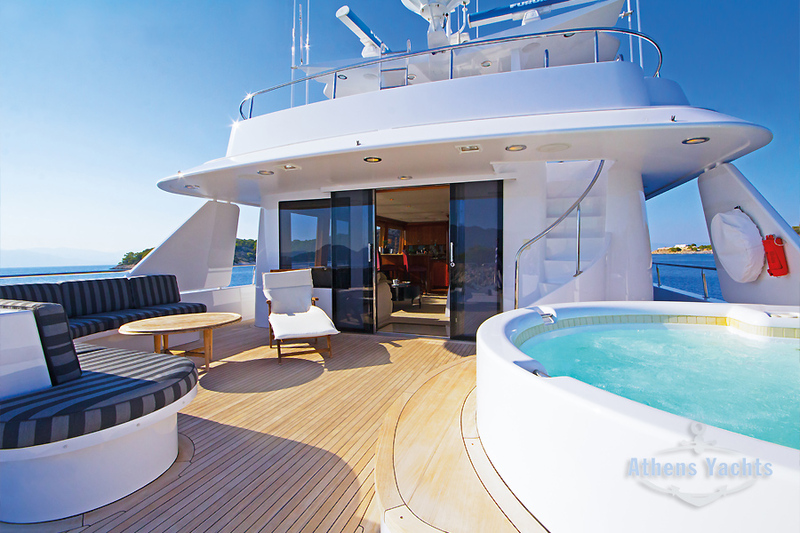 Stairs from the aft main deck enable guests to access this Jacuzzi on the upper aft deck without going through the VIP stateroom. 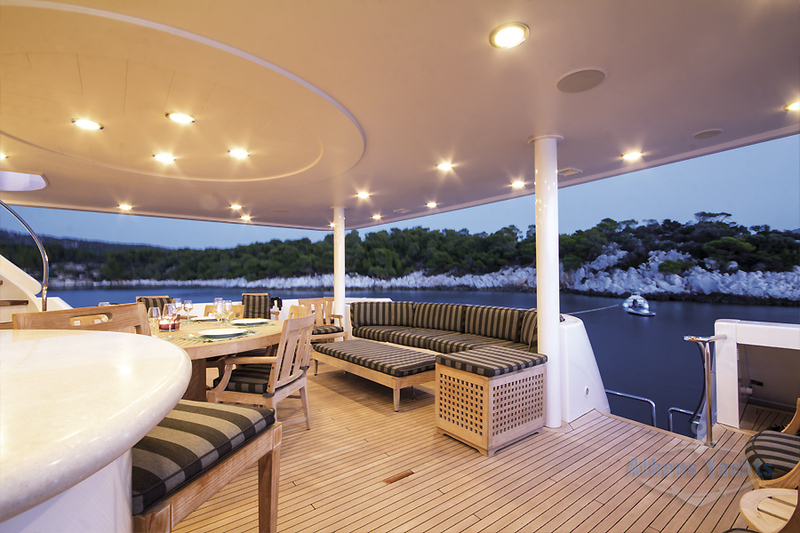 Stairs also lead from the upper aft deck to the newly teak decked sun deck, which has a bimini shade awning and seats all around. 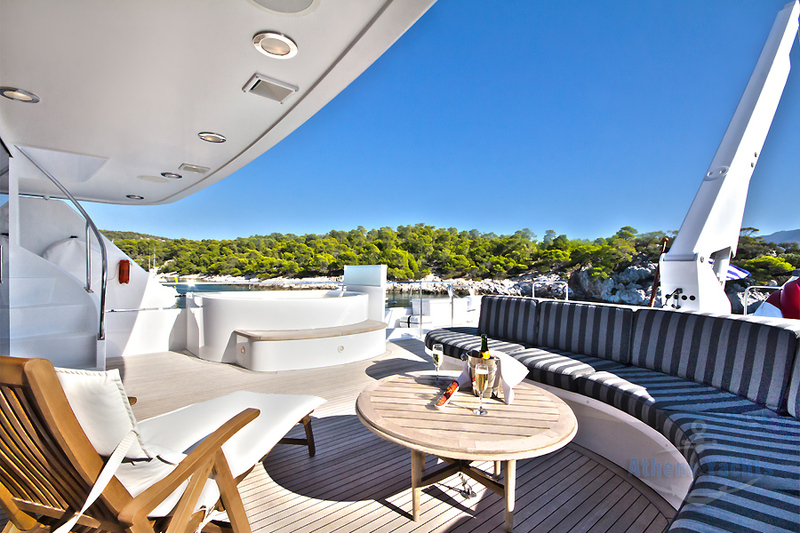 So guests entertaining areas include the saloon, aft main deck, upper aft deck, and sun deck, where there is a dining table for ten and sunbathing. 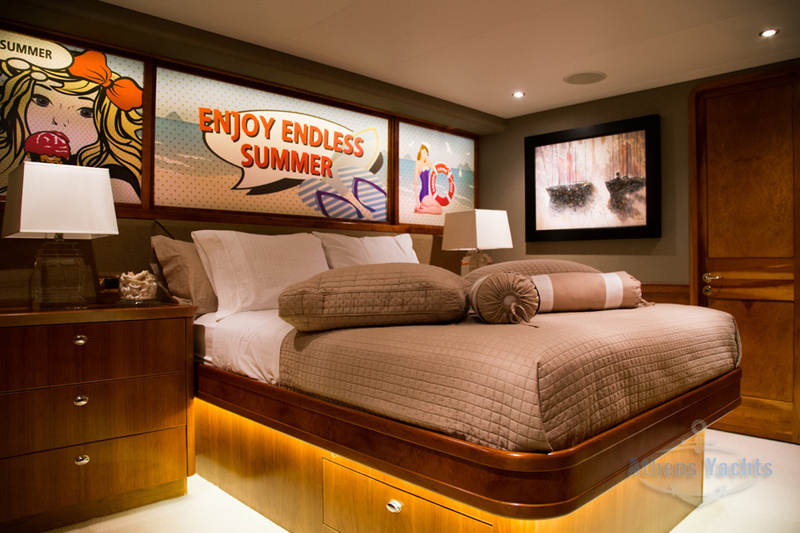 ENDLESS SUMMER has six guest staterooms for parties of twelve. 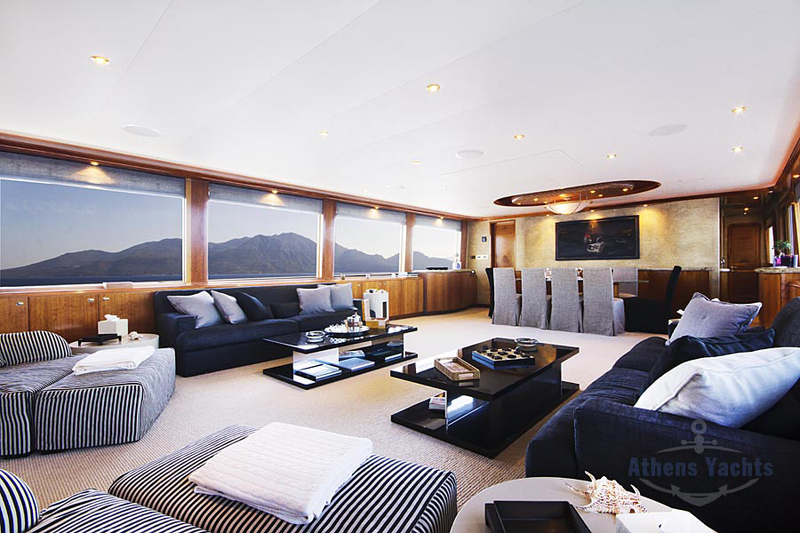 In addition to the bridge deck VIP, the master cabin is located forward of the main saloon on the main deck with windows all around. It is the full beam of the ship with King bed. Its bathroom is the full beam of the ship as well (it’s larger than the VIP cabin’s bathroom), all done in marble with tub and stall shower with many jets, and it has a walk-in closet. 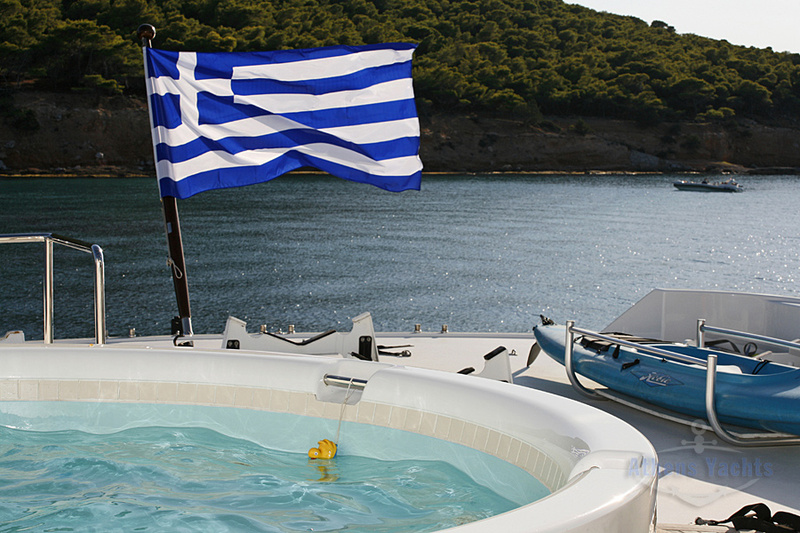 Four guest staterooms are below: 2 Queens and Two Twins, each with private bathroom. The two twin cabins convert to doubles if needed. ENDLESS SUMMER’s saloon is an elegant compartment in black and white…. The arm chairs are upholstered in black and white stripes; there are new white cotton carpets; two black couches around a black ebony coffee table; gray bean bag chairs. It’s romantic. It has a drop down TV, teak paneling. 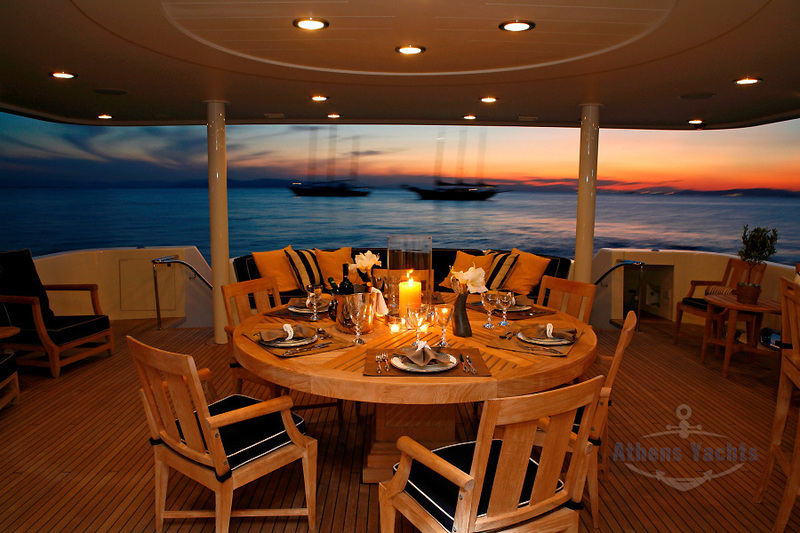 It opens to the aft deck with a teak, hand rubbed round dining table. 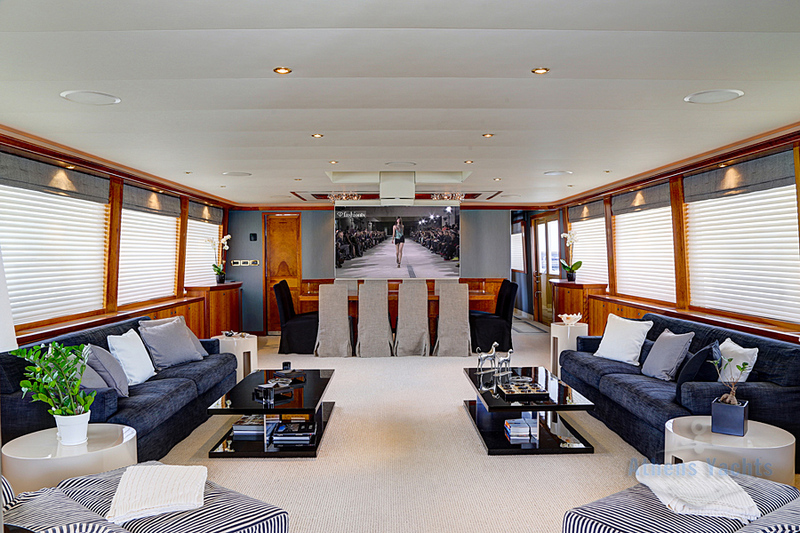 Forward of the saloon is an interior dining table as well, which is beautifully set… The foyer leading to the main deck master is done in black tile, and there is a day head. 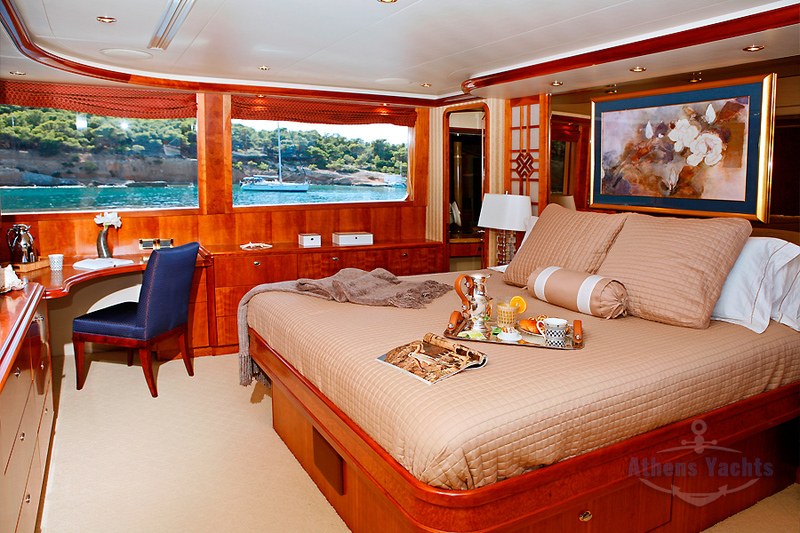 Forward of VIP stateroom on the bridge deck is a pilot house with all new navigation equipment and seating for guests. 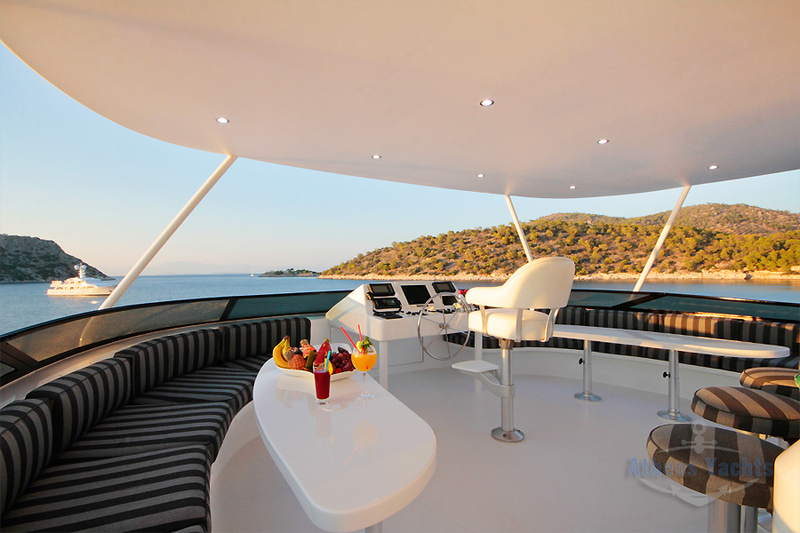 Stairs from the captain’s bridge or pilot house lead to the sun deck, where there are outdoor steering controls. While the chief stewardess Catarina was new in 2016, the captain, chef, bosun and four additional crew remain the same, and they are cheerful, jolly, pretty, young, and attentive. 8 Crew total. 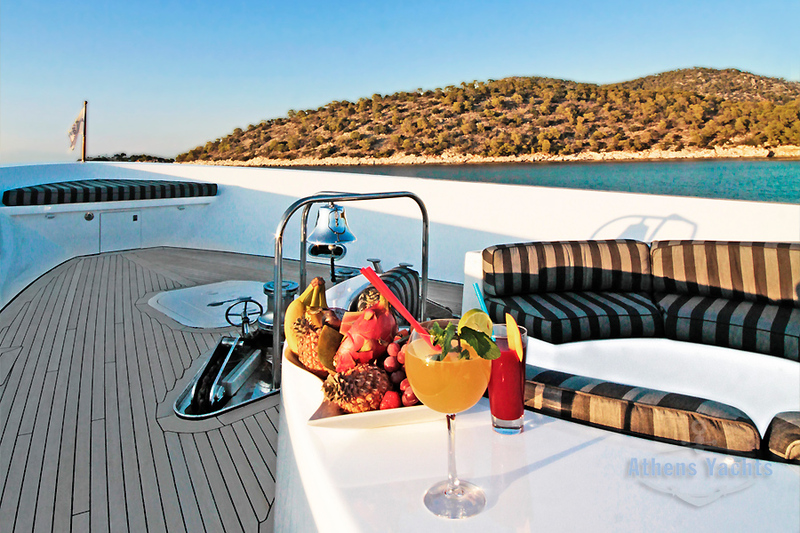 ENDLESS SUMMER sails out of Athens and cruises the Cyclades, Ionian Sea, and the Dodecanese Islands (situated along the coast of Turkey.) 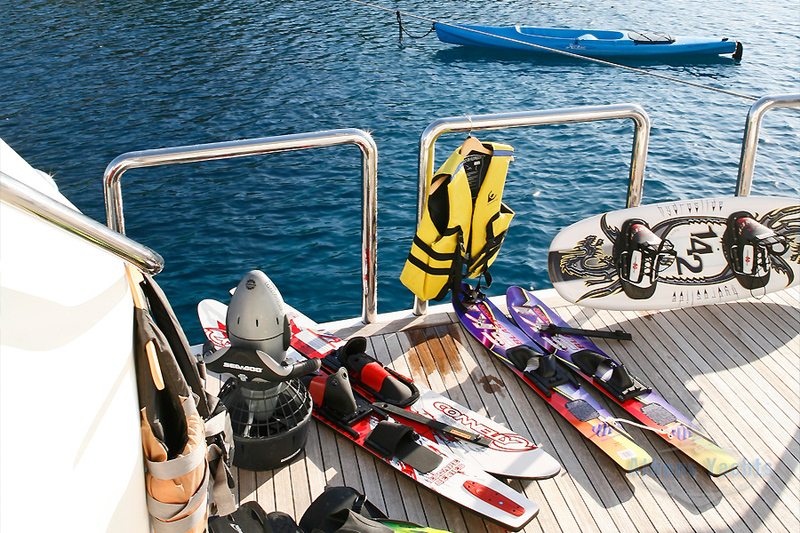 Among her many amenities include two jet skis, three bicycles, a kayak, and a submersible.